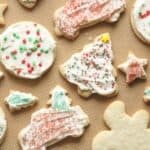 The best gluten-free sugar cookies! The cookies are tender yet crisp & definitely not dry. They hold their shape perfectly for Christmas cut-outs. 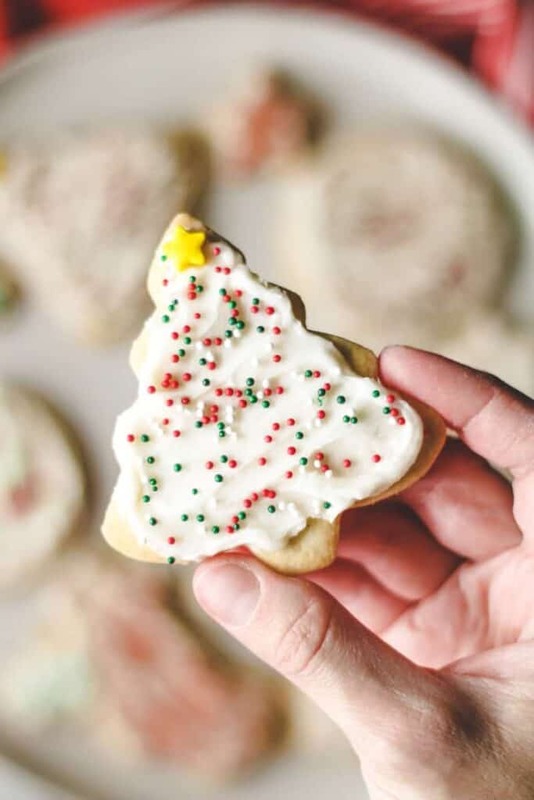 Christmas isn’t Christmas without Gluten-free Sugar Cookies! Making cut-out cookies is a weekend-long extravaganza in our house. From making double & triple batches of dough and frosting to spending hours decorating to our heart’s content. It’s one of my favorite holiday traditions. There really aren’t any fancy ingredients in my cut out cookies! Regular sugar, brown sugar, butter, eggs, vanilla and milk are blended together. Then gluten-free flour, baking powder, and salt are added. The most notable difference between my recipe and other recipes is that I add in a little brown sugar! The brown sugar makes them a bit more tender, adds moisture so they’re not dry, yet still allows for a nice crisp sugar cookie. As for the gluten-free flour, I used Pamela’s Artisan Blend All-Purpose flour (affiliate link). I love that mix. It works really well in a lot of recipes, like these frosted pumpkin cookies. I get mine from Thrive Market, they usually have a great price there. 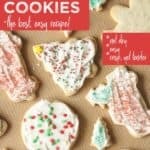 The process is just like any other sugar cookie recipe! Start by mixing the wet ingredients. Cream the butter and sugars together. Then mix in the egg, vanilla, and milk. Next, whisk together the dry ingredients. Then dump the dry mixture into the wet mixture and mix until very well combined. The mixture should make a stiff dough. Gather the dough into a ball and wrap in a plastic bag or plastic wrap. The next step… Chill the dough. Yes. You have to chill the dough. I’m sorry, but you just do. Put the dough in the refrigerator for at least 2 hours or overnight. The chilled dough will be less sticky and easier to roll out. You also want the dough cold so that the cookies hold their shape in the oven! Let the dough warm up on the counter for up to 15 minutes before rolling out the cookies. Sprinkle flour on your surface and rolling pin so that they don’t stick to the rolling pin or counter. You can gather the scraps and re-roll the dough so you don’t waste any! The cookies bake at 350 for about 10-12 minutes depending on how crisp you like them. Once they start getting light brown, you know they will be crisp. For softer cookies, pull the cookies out before they brown. Frosting… the most important part? You can use any frosting or icing recipe you like! What do I use? #TeamButtercream for these sugar cookies. Store these cookies in an airtight container for several days. The cookies can also be frozen for at least one month! You can freeze them unfrosted or frosted! 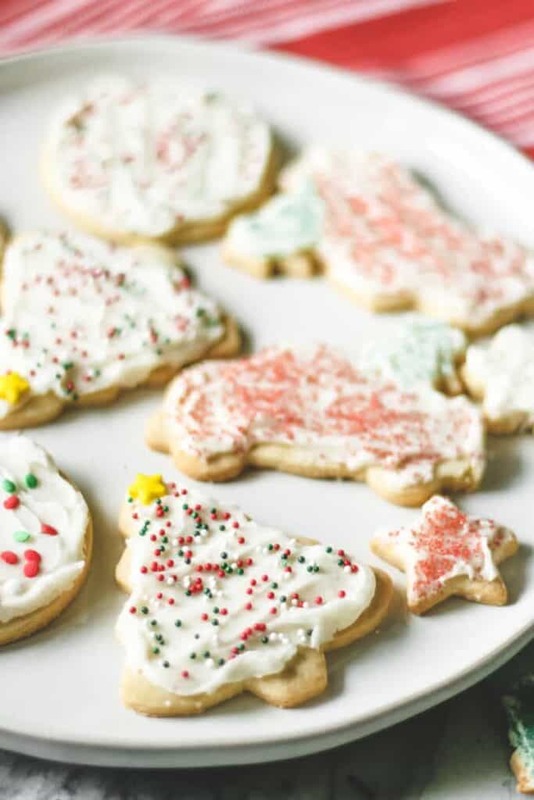 So go ahead and get your cookies baked and/or frosted well before the holidays! To thaw, just pull them out and let them thaw at room temperature. You’ll be surprised at how well they hold up! They taste just as fresh as the day they were baked. 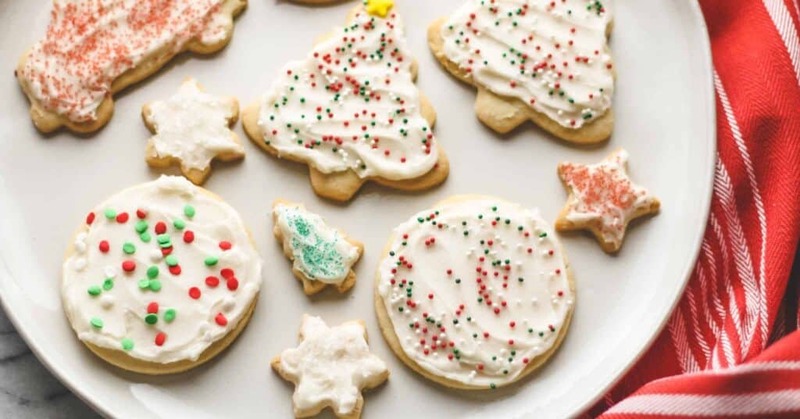 If you make the sugar cookies even just a few days to a week ahead of Christmas, I would still pop them in the freezer until the day of so they are nice and fresh! 4 cups powdered sugar about 1 lb. Whisk together the gluten-free flour, baking powder, & salt. Set aside. 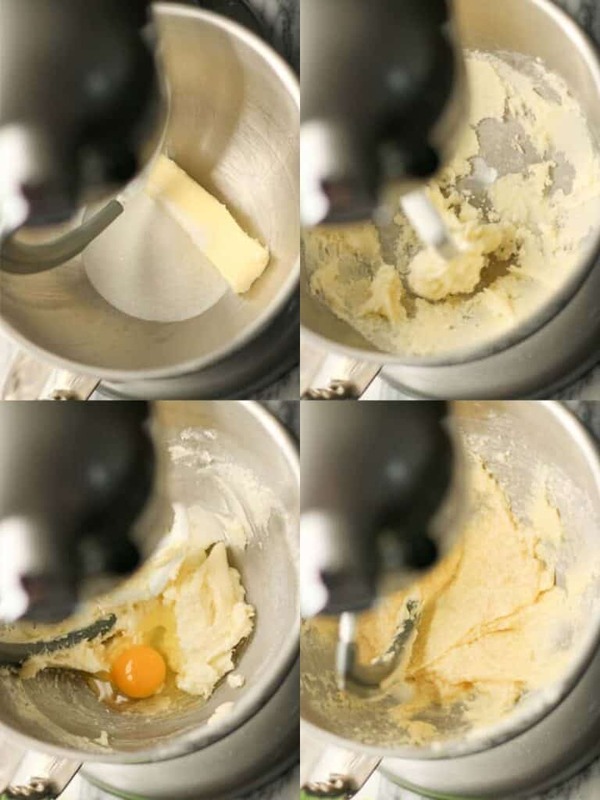 In a mixer bowl, cream the butter and sugars together until light and fluffy. About 1-2 minutes. Add in the egg, vanilla, and milk. Mix until well combined. Dump in the dry ingredients. Mix again until well combined. Gather the dough into a ball and wrap in plastic wrap or a plastic bag. Chill the dough in the refrigerator 2 hrs or overnight. Preheat the oven to 350°F. Line two baking sheets with parchment paper or silicone mats. 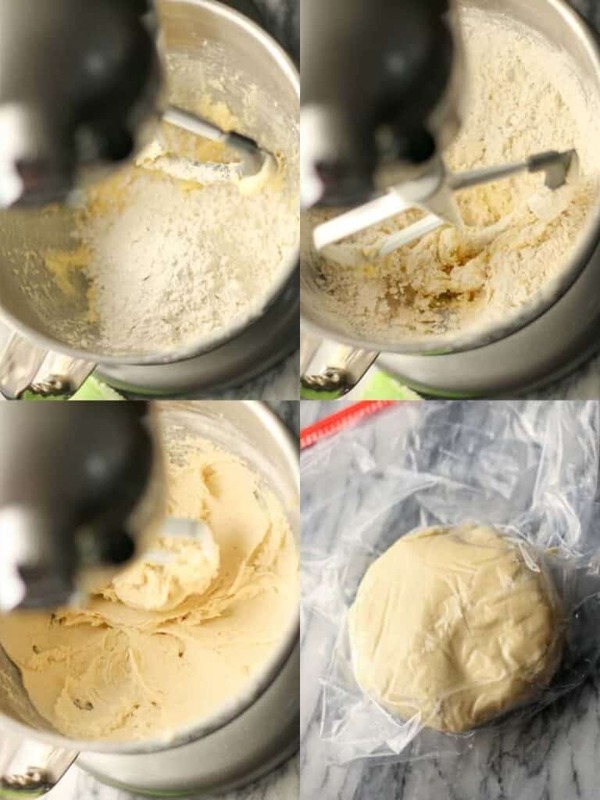 Remove the dough from the refrigerator and allow to set at room temperature up to 15 minutes. Sprinkle flour on your rolling surface and the rolling pin. Lay the dough out and sprinkle a little flour on top. Roll the dough out to 1/4-inch thickness, adding more flour as needed to prevent sticking. 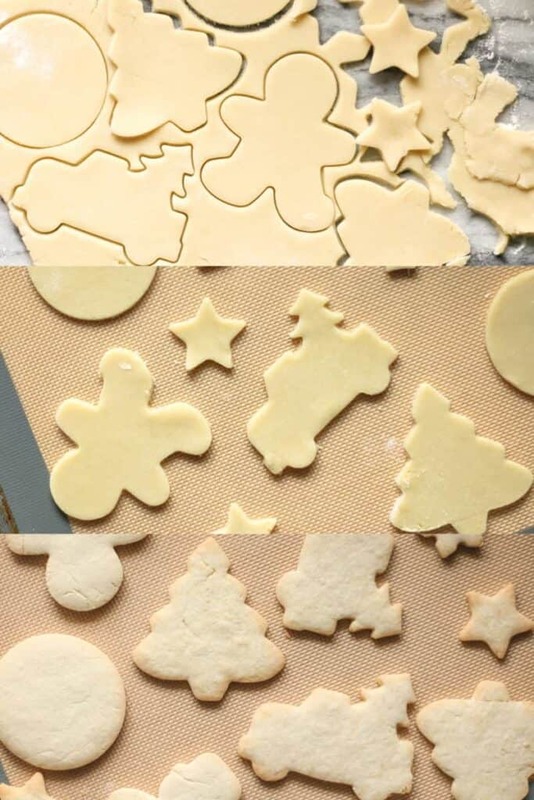 Use cookie cutters to cut out shapes and place them on the baking sheets, leaving a little space between cookies. Gather remaining dough scraps and re-roll. Continue to re-roll and cut out shapes until all the dough has been used. Bake in batches as cookie sheets fill up. Bake the cookies at 350°F 10-12 minutes. For crisper cookies, allow the cookies to get lightly browned. For not so crisp cookies, pull them from the oven before they brown. Cream together the softened butter and shortening in mixer bowl. Add in the powdered sugar and vanilla and mix until combined. Add milk, 1 Tablespoon at a time, mixing well after each addition. Keep adding milk until a fluffy, smooth, & spreadable consistency is reached. Divide frosting and use gel food coloring to tint, if desired. Made these cookies yesterday and they turned out great! The thinner cookies were easier to decorate; I accidentally left a few cookies too thick, and they crumbled easier but tasted really yummy. I would recommend these and make them again! These really do taste as good as, if not better than, any other sugar cookie ! Thank you! They really are good!